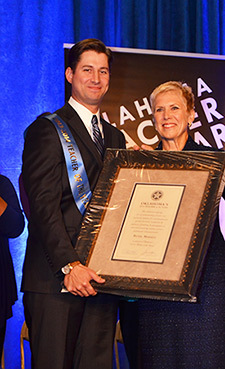 Peter L. Markes, an 8th- through 12th-grade string orchestra and Advanced Placement music theory teacher from Edmond North High School in the Edmond School District was named the 2014 Teacher of the Year by State Superintendent of Public Instruction Janet Barresi during a ceremony Tuesday at the Oklahoma State Fair. “Mr. 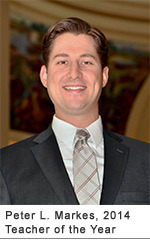 Markes’ passion for teaching and instilling confidence in his students as well as his ability to interweave the more rigorous Oklahoma Academic Standards into his classroom work epitomizes what we strive for in every effective teacher,” said State Superintendent of Public Instruction Janet Barresi. Markes has 12 years of teaching experience, 11 in his current position. He has a bachelor’s degree of Music in Education, with an emphasis on instrumental music from Oklahoma City University. Committees comprised of teachers, parents and community members selected the 12 finalists – two finalists from each of the six regions in the state. A state committee comprised of education business and civic leaders chose the winner. The state-level competition included individual and group interviews, a written portfolio, and personal videos showcasing each finalist’s teaching strategies. Markes will represent Oklahoma in the national Teacher of the Year competition in the spring of 2014. The national competition is sponsored by the Council of Chief State School Officers and the ING Foundation. Several event sponsors congratulated Markes with gifts valued at about $50,000 in cash and prizes, including $5,000 from the Masonic Charity Foundation of Oklahoma; the use of a Buick Encore for a year from Byford, Buick and GMC of Chickasha, Oklahoma, in cooperation with the Oklahoma State Fair; products, software and professional development from SMART Technologies; a laptop computer from Oklahoma Schools Insurance Group; $1,000, a $2,500 tuition credit, a $500 credit toward a classroom makeover, and a Greg Burns print from American Fidelity Assurance Company; numerous scholarships and tuition waivers from many of the state’s universities; among many other gifts. Markes will serve as Oklahoma's "Ambassador of Teaching,” presenting to teachers and civic groups throughout the state for one year. Each finalist received prizes including a $1,000 award from Masonic Charity Foundation of Oklahoma; two courtside tickets and in-game recognition to an Oklahoma City Thunder game, a $100 gift card and other gifts from American Fidelity Assurance Company, in conjunction with the Oklahoma City Thunder; software and professional development from SMART Technologies; as well as gifts from the Oklahoma State Fair, the Oklahoma Education Association and Professional Oklahoma Educators. The Teacher of the Year Ceremony is presented by the state Department of Education, its long- time partners the State Fair of Oklahoma and Masonic Charity Foundation of Oklahoma, American Fidelity Assurance Company as well as a long list of contributors.